The following are the commonly used logic to swap two values. x = x-y; //Now x=3 and y=5 and hence swapped. << shifts the bits to the left by the denoted positions. N << 1 shifts the bits in N to the left by 1 position. Consider 9 whose binary representation is 1001. Now when 1001 is shifted left using << by 1, we get 10010 (a zero is added in the end). Decimal value of 10010 is 18. So the below program prints 18 as the output. Now 1001 is shifted left using << by 1. So it becomes 10010. Decimal value of 10010 is 18. Consider N=6. Binary representation of 6 is 110. Now 110 is shifted left using << by 2 giving the value as 11000. Decimal value of 11000 is 24. So the output of the program is 24. Now 110 is shifted left using << by 2. So it becomes 11000. Decimal value of 11000 is 24. How to add two numbers in all supported programming languages? Accept two integers then add and print their sum. Read and convert the first line to two integers. Then print their sum. But from Java SE 5.0 onwards we can also use the varargs as given below. The three dots indicates varargs (Variable arguments). You can use a varargs variable like an Array. As an example when the following program is given Skill Rack as input, it prints Rack (which is the second argument. As index starts from 0, index 1 denotes second argument). Consider the program below. Can you guess what the program is trying to do? Also note the amount of time you take to figure it out. Logic - How to check if a character is a vowel in a given String? Let us say we are given a string and asked to print the vowels in the string. Vowels can be in upper case AEIOU or in lower case aeiou. Here instead of comparing all 10 values (5 in upper case and 5 in lower case), we convert the character to be compared to lower case and do the comparison. So we define a method isVowel to check if a given character is a vowel or not. Let us explore the solutions in various programming languages. How to scan (accept) a single character in Java? There is NO method as nextChar() in java.util.Scanner class in Java. We need to use the next() method to read a single character as a string and then use charAt(0) to get the first character of that string. The below program accepts a character and prints the same character as the output. Note: Here we are reading the single character as a string and getting the first character using charAt(0) from that string. In C, using %s in scanf accepts a string value only till the first non-white space character. For example, the below program will print only One when One Two Three is given as input. So to accept a string with space we can use the following approaches. Use fgets to accept the input string value (which has one or more spaces in it). This program will print One Two Three when One Two Three is given as input. Use ^\n to instruct the scanf to read till a new line character is encountered in the input value. 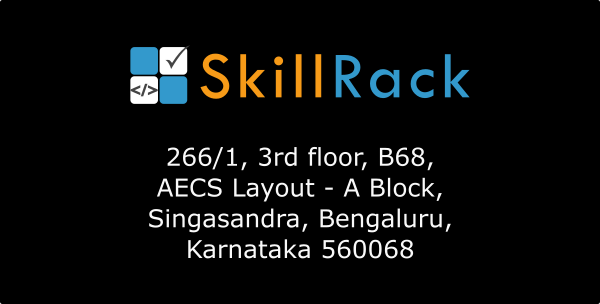 The portal http://kickstart.skillrack.com/ is an initiative from SkillRack for students who wish to learn programming. Over 1000+ programs will be published. No login or payment is required. SkillRack.com is an online platform to learn from programming basics to enhance your skills till competitive programming. SkillRack is arranging a free half day orientation session for the 2018 batch students who are not yet placed. The session will consist of the following. - 10 programming concepts and solving related programs asked in major IT companies hands-on (You will solve the programs using www.skillrack.com) and SkillRack mentors will assist you. When is this session happening? - The session will be happening on 11th October 2018 from 10:00 am to 12:30 noon at our Bengaluru office address mentioned below. - The orientation session is free and you need not pay for it. Why is the session free (as every one has a business motive)? What's the count of participants allowed? - Only 30 are allowed in a session. Hence please register at this Google Form link entering your email and phone number. We will email and confirm the approval of your registration. Session 2: Contains 10 questions related to English Verbal Reasoning and Proficiency (Duration 10 minutes). Contains 1 Programming Challenge to be solved in 20 minutes. LOG into www.SkillRack.com to take TCS NInja tests. Medals - When Gold, Silver and Bronze are awarded? Bronze medals are awarded when the following tasks are fulfilled. Silver medals are awarded when the following tasks are fulfilled. Gold medals are awarded when the following tasks are fulfilled. More tasks will be added when new features are introduced or based on the feedback from users. In this program we will reverse an input String and print the reversed String. We will use StringBuilder to achieve the reversal. //We will reverse the String using StringBuilder. In this article we will look at a Java program that will print Fibonacci series upto a certain number of terms using recursion. The number of terms is passed as input. INFOSYS Campus Hiring TEST Pattern (The campus hiring online test pattern has not been changed for the past 4 years. The latest Infosys pattern for 2018 - 2019 graduation batch is given below. Section 3: Verbal : 40 questions in 35 minutes. But Infosys changes the question by preparing different question sets for each event. So while you will get the similar pattern of questions, it is difficult to get the exact questions repeated. - One analytical puzzle where data is given and 3-4 questions are asked based on the given data. Observation: 5-6 questions will be easy to solve. Remaining questions will be time consuming - particularly crypt arithmetic and the analytical puzzle questions. Observation: Easiest section to solve if you have practised similar type of questions earlier. - Remaining questions from a variety of topics like One word substitution, Synonyms and Antonyms etc but the above 4 are asked often.